It’s been a while since I’ve posted a photo from Japan, so it’s time to rectify that situation. 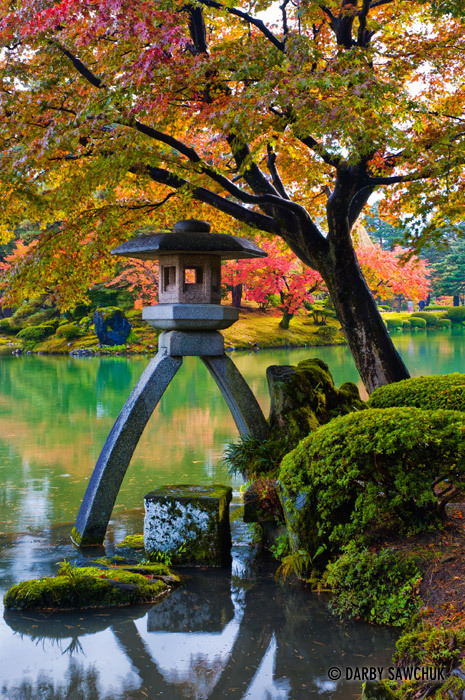 Kanazawa’s Kenrokuen gardens make it onto one of Japan’s weird lists: “the three most beautiful landscape gardens.” I don’t know many other cultures that would feel the need to make that kind of ranking, but I consider that one of the endearing things about the Japanese. In any case, yes, it’s a truly gorgeous place. I saw it while on a trip with my co-workers and I got a taste of the Japanese’s penchant for whirlwind visits. I had to be quick to get away from the pack and set up the tripod for a few moments. This image is of The Kotoji Lantern which is said to look like the bridge on the Japanese traditional instrument, the koto. It’s an iconic view of the garden and a symbol of the city. I was fortunate to have some of Japan’s spectacularly-coloured autumn leaves in the background. This entry was posted on Wednesday, August 10th, 2011 at 9:00 am. It is filed under Blog, Japan, Photo of the Day, Photography and tagged with japan, kanazawa, landscape photography, Photo of the Day, Photography, potd, travel photography. You can follow any responses to this entry through the RSS 2.0 feed.